Will Marty throws a pass downfield. Marty threw for 197 yards, two touchdowns and two interceptions in the loss to Valparaiso. Jimmy Lafakis/Collegian file photo. 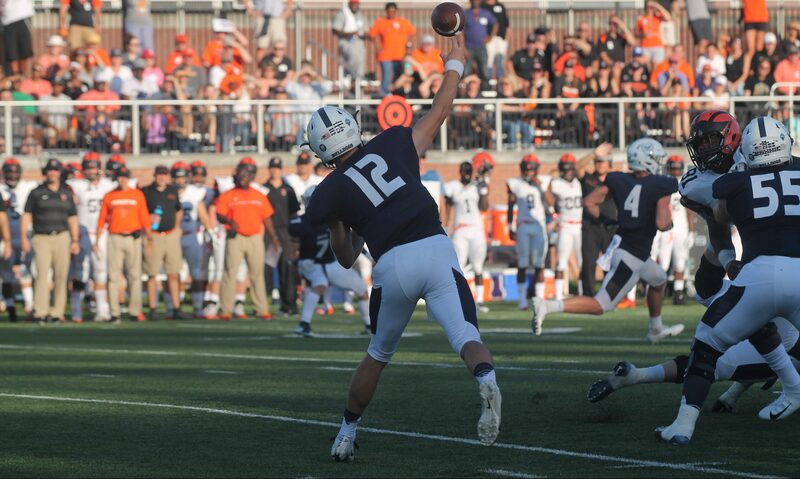 The Butler University football team lost 35-17 to Valparaiso University on Oct. 13. The loss was Butler’s second consecutive in conference play. The first quarter was all Valpo. Butler went three-and-out three times in the period while surrendering two touchdowns. Valparaiso took a total of 21 plays to score the 14 points. Butler flipped the script in the second, scoring two touchdowns of their own while holding the Crusaders scoreless in the quarter. A 40-yard pass from redshirt senior quarterback Will Marty to Stephen Dennis set up a short touchdown catch for Pace Temple. After the Bulldogs forced a punt in their own territory, redshirt junior running back Brad Sznajder rushed for 48 yards in one drive, setting up another short Temple touchdown catch and tying the game. The two teams took the 14-14 score to halftime. Valparaiso took the second half’s opening kickoff to the end zone, a 97-yard return. Butler’s junior kicker Drew Bevelhimer nailed a 39-yard field goal on the ensuing possession to cut the Bulldogs’ deficit to four. Failing to convert on a key fourth-and-one in enemy territory at the beginning of the fourth quarter was bad for Butler. Giving up a touchdown on the ensuing possession was worse. Still, Butler was in the game, down 11 with about seven minutes remaining. Marty threw an interception on the next play, which was turned into a Valparaiso touchdown a play after that. Marty threw another interception after Butler got the ball back, and the Crusaders were able to drain the rest of the clock. Valparaiso maintains possession of the Hoosier Helmet Trophy, beating the Bulldogs for the second straight year. Butler hosts the University of San Diego next week. The Toreros are in the midst of a 24-game PFL winning streak and haven’t lost in the conference since Oct. 10, 2015. The Bulldogs are now 3-3 overall and 1-2 in conference play.